i am stubborn. i don’t give up. A few weeks ago, in the midst of the end-of-book frenzy, I posted this piece, about my gluten-free attempt at the no-knead bread going around the internet, slavishly reported upon by blogger after blogger, all of them able to eat gluten. Dutifully, twice, I followed all the instructions, with gluten-free breads. Both times, my attempts were disastrously funny. Readers wrote to me, asking me to try again. Many, many people on this thread at the Delphi forums insisted  in almost messianic tones  that it was possible! Really! Even though I was within weeks of finishing the most important project of my life, and I really should have been devoting my time to testing all those recipes in the book, one more time, I swerved away from my original plan. Beguiled by the smell of yeast in warm baked goods, and the desire to conquer something I publicly admitted I could not do, I relented. I started baking bread. Hard work and sheer mule stubbornness pay off. Over the past month, I have made at least twenty loaves of this bread. The first few attempts were mediocre, a modicum of bread taste and too much denseness. But then, I stumbled upon a couple of secrets  with the help of the Chef  and I started making bread. Warm bread, straight from the oven, with an almost-airy crumb, and a crust so crunchy I worried I could crack my teeth. Bread. I started making bread. Last August, when Sharon was here, visiting for my 40th birthday, she and the Chef and I sat down to breakfast. I happened to have some packaged gluten-free bread  a semi-decent brand, their cinnamon-raisin bread  and toasted some to go with my eggs. Sharon asked for a slice. I handed one over, reluctantly. She chewed, thoughtfully, then chewed some more. After a full moment, she said, Hm. Its really more of a texture than a taste, isnt it? We all laughed. She was right. Most gluten-free breads really are just a dense texture, a weak-signal echo of real bread. Thats why I spent the first full year after my celiac diagnosis divorcing myself from bread, entirely. This gluten-free bread, however, tastes like bread. Soft and warm, a small chewiness, then air between the teeth. A brown, cracked crust, a wonderful contrast against the soft crumb. It smells like yeast and grandmothers and a cold winters day with a bowl of soup. Now, here are a few notes for you, based on my baking instincts, and tweaks from the Chef. The eighteen hours of rising called for in the original recipe? Absolutely not necessary. No matter how hard we try, or how well intentioned we are, we will never replicate the physical characteristics of gluten. The eighteen hours of rising make the gluten strands grow, in the typical bread. We gluten-free girls and guys just dont need it. However, this is a joy. From mixing the bread to eating some can take as little as two hours. Save some time. One of the secrets of the bread? Club soda. On one of my baking attempts, I knew that I wanted the bread to be lighter, a little more airy. It needed…carbonation. I used the warm club soda on the counter, instead of water or milk. It does the trick, every time. Make sure the club soda is warm when you use it, however. Cold club soda could kill the yeast. The only part of that eighteen-hour recipe that turns out to be a revelation here is the last part. Heating the oven to 500°, then putting in a Dutch oven for half an hour to heat? It makes the pan sizzle when you throw in the gloppy dough. This is what creates that incredible crust. Keep that. Its important. I have fiddled with a dozen different combinations of flours and starches for this recipe. This is, for the moment, the one that works best for us. But you should try some yourself, and let me know if you find anything you like more. One note for those of you in Seattle. The Chef approves of this bread so highly that he has asked me to make a loaf every few days for the restaurant. That way, those of you who must eat gluten-free who come in for a meal can have warm bread delivered to your table. And one of his appetizers this month is a salad, with Shaunas croutons. Thats the way it is printed on the menu. Oh, that man. However, I have to say this. We have eaten this bread for a month. We had a loaf of rosemary sea salt bread with Christmas dinner. We have made French toast, pappa alla pomodoro, bread pudding, macaroni and cheese with bread crumbs, and a dozen sandwiches. And you know what surprises me? I find that I am tired of bread. Strange, isnt it? After worrying that I would never eat it again, I found that I have eaten my fill, for the time being. Im back to toasted quinoa and sautéed kale and rice pudding these days. Still, I hope you enjoy it. Bon appetit! Some recipes are merely a list of ingredients, a guideline for what to try. But I have to say  as is true for most baking  the techniques and the order in which you use these ingredients really matters here. The Chef told me recently that one of his favorite head chefs, when he was training long ago, said this, Try a recipe exactly the way it is written, once. That way, when you adapt it for yourself, you will always have a memory of what worked for you. I recommend the same for this bread. Then, go wild. Preheat the oven to 200°. Let it come to temperature. Put all the dry ingredients into the bowl of your stand mixer. Turn on the mixer and combine the flours and other dry ingredients well. Turn it off. Add the white wine vinegar and keep the machine running. Add the eggs, one at a time, and allow the mixer to beat them into the dry ingredients, on low speed. After you have added all the eggs, pour in the club soda, in a slow drizzle. Pour in only as much as is needed to wet all the ingredients completely and combine this into a dough. Turn the oven off, immediately. Attach the dough hook to the mixer and stir the dough on medium speed for three to four minutes. This will give the dough a chance to cohere more evenly. It will also whip air into the dough, which will cut the usual density of gluten-free bread. After those three to four minutes, turn off the mixer and transfer the dough to an oiled bowl. Put the bowl into the oven, which will be warm, but not actively heating. Allow it to stay in there for forty-five minutes. It will not have risen much, at this point. Just a bit. Its gluten-free, after all. There is no gluten to push along that rising. Accept that. Take the bowl out of the oven and put it on the stovetop. Turn the oven up to 500°. Put a cast-iron pot, large enough to hold the bread, into the oven. A cast-iron dutch oven with an enamel surface is probably ideal. But any large pot or pan will do, as long as it has a lid. Leave the dutch oven in the 500° heat for half an hour. Meanwhile, the dough will be doing its small rising on the stove. After half an hour, take the dutch oven out of the oven, carefully. Without worrying too much about the perfect shape, transfer the wet dough into the hot dutch oven. Put the lid on and push the dutch oven back into the oven, immediately. Set your timer for thirty minutes. Do not turn down the heat. Allow the bread to cook in there, with the lid on, for the entire thirty minutes. By the end, it will really smell like fresh-baked bread. Take the pot out of the oven, take the lid off the pot, and voilå  a lumpy, wonderfully crusted loaf of gluten-free bread. Allow it to cool for ten minutes, then cut right into it. You can also use this dough and technique for any number of variations. For olive bread, put ½ cup chopped kalamata olives into the dough. For rosemary bread, add one tablespoon of chopped fresh rosemary into the dough, the sprinkle thick crystals of sea salt on the top of the bread before baking. Be creative and do what you can. I had to try your recipe as soon as I saw it. I had tried and tried to get the original to work but no real success, but yours was wonderful. There it goes again. I guess I know what I am doing this long weekend ahead. Thank you thank you thank you. Oh Ms. Shauna you are a wonder! I’m sorry to address you familiarly, but I’ve been reading your site for almost a year now, and feel like you are an old friend. Yay for being stubborn! May I also say that your peanut butter cookies are some of the best cookies? So easy and tasty, I’ve already made them several times. I can’t thank you enough for this, Shauna! I’m going to try this out as soon possible. Yummy, crusty bread – I can’t believe it! I’ve had some hit-or-miss experiences with my new bread machine, but am very excited to try this as well. What would you recommend for someone who has not yet added a standing mixer to her culinary arsenal? Would a hand-held mixer do, or better to try by hand? Yes, please please share your thoughts for those of us that do not have a bread maker. Congratulations! How exciting that you succeeded and, then, get your name on a menu. Woo! Way to go! Persistence is a good trait! You constantly amaze me. That loaf calls out to have a bit torn off and eaten. Thanks again for your wonderful website. It is a constant companion for our family. My son, my daughter, my mother and I are all gluten intolerant, and my father is now undergoing testing as well. So you can imagine how welcome you are in our family! I would love to try this recipe. You mentioned yeast in the writing above, but I didn’t see yeast in the recipe. How much yeast is called for? Does it need to be bloomed a bit first? Thank you so much! Looking forward to your book!!! Shauna, can’t wait to try this — though I never seem to have quite all the “right” ingredients in my house when it comes to GF baking. In this case, a question: Is potato starch the same, or different from, potato flour. (I have potato flour, of course, and not the other.) Thank you for all your perseverance. I still await the BOOK!! I am proud of you, I am thankful, and above all I CAN’T FREAKIN WAIT TO TRY THIS OUT! Shauna you’re a genius! If I’m ever in Seattle I’ll have to get some of your wonderful bread at your Chef’s restaurant! Your post has me craving bread! Getting all of those ingredients is daunting! So beautiful a bread. In my book stubborn has always been a positive character trait and here you show that fully. This sounds too good to be true, but heavenly. I am incredibly happy to see this! Shrieking with joy and jumping up and down kind of happy! My friend was raving about the normal version of the no-knead bread (as I watched him make and devour it), and for the first time in a long time I was jealous. So I am dying to make the GF version for myself this weekend! Congrats on achieving success in the bread-baking department. I plan to try this recipe of yours, and to compare it to the various GF bread recipes Laura (my wife) has put online over the past couple months. We have all the ingredients handy aside from the club sodea, and then just need the time to give it a try. We’ve done a few soda-leavened breads, and some yeast-leavened ones too. Never have we tried any that required 18 hours of patience though. If the bread is worth the wait, it must be good! I am glad persistence has paid off for you. Keep up the wonderful work. It’s great that you have found a way to do this – Celiacs should worship you! I’m not gluten intolerant but I would like to find ways to reduce wheat in my diet, and since discovering the NK Bread, I’ve done anything but (made 13 loaves so far)! So I may try this myself, but I’m going to wait and see if you have any suggestions for Michelle who, like me, does not have a bread machine. Next time I’m in Seattle I’m going to be sure to visit the Chef’s restaurant. I would love to make your bread for my boys but they cannot have eggs. Do you thing the egg replacer would work just as well? PS Please feel free to visit pics of my boys anytime…and thank you for the compliments. I hope you are blessed someday with some just as fantastic. Boy, are we ever so glad you’re stubborn! Can’t wait to try this Shauna. It looks divine! I’ve recently discovered sorghum flour (from Rebecca Riley’s gluten free cookbook) and found it also to be the closest to whole wheat flour. But I sure can relate to what you said – for my first year (which I’ve just celebrated not too long ago), I vacillated between thinking I needed to give up bread entirely and trying to find something that was palatable. Finally! I have been waiting for you to post that bread recipe since you mentioned it weeks ago! I have devoted December and January to figuring out GF bread baking, easier now that I have a Kitchen aid mixer. I have a sorghum sourdough starter on the counter right now that I will try this week. February will be for figuring out homemade GF ravioli! Thanks for the continued inspiration and adventures in baking. I hate to say it, but I was disappointed with the results. It was soooo salty . . . but it was crusty and had a nice crumb. That’s how I felt when I made the first loaf that worked! I’m so glad that it worked for you. Sighing is good for the soul. Releases carbon monoxide. So is good bread. You may always address me with the familiar tone. It’s funny, isn’t it, this internet thing? I feel as though we are all a community. I would love it if we could all meet in a real room. It is yummy and crusty. I hope it worked well for you! I’m sure that mixing by hand would work. In fact, I love that handmade process. As few machines as possible — probably tastes better! The taste of this bread is plenty on its own. However, I do get a little catch in my throat, every time I see my name on his menu. When you do finally make it up to Seattle, I will happily give you a piece torn off from this bread. Right after I give you a big hug. Thanks for pointing out the yeast discrepancy! I corrected that immediately. And the book? October of 2007. I’m all aquiver, thinking of it! Oh dear. Potato starch and potato flour? Well, from what I understand, they are different. Potato flour is made out of the entire potato, while potato starch is made from only the starchy portion of the portion. I use potato starch, because that seems to be the most widely available! Anonymous (and Amy Jo), I’m afraid I don’t have any real experience with replacing eggs. However, both of your methods sound good to me. Experiment and see what you think! Luisa, thank you, my dear. You are the one who started it all! Anonymous in Spokane, Please feel free to email me at mailglutenfree@gmail.com. Bengalichick, Don’t be daunted. Bob’s Red Mill makes little bags of all of these. Go to a Whole Foods and they will all be sitting there for you, in the baking aisle. Anonymous, I try to waver between stubborn and letting go. It depends on the moment, of course. Nat, oh goody! Do tell, how was it? Mike, You don’t need 18 hours for this one! But between you and your wife, I’m sure you have already come up with a bread just as good as this one! Anna Maria, You know, this is a good bread, no matter what you can eat. You can make it by hand. And please come to the Chef’s restaurant and say hi! Shari, no one has ever thanked me for being stubborn before! Ellen, I am so glad you have discovered sorghum flour. It’s funny, isn’t it? I just don’t miss bread. But lately, I’ve eaten so much of it that I have gone back to taking it for granted again! Celtigjig, good for you! This is all about the experimenting and playing. None of us has the perfect recipe. But it’s so good to know that it can be done! Kathyrn, Oh, I’m sorry that it was too salty for you! We all have our own tastes. However, if you liked the crust and crumb, just make it again, with a little less salt. (I’ll adjust the recipe to say 1 to 2 teaspoons.) Part of it depends on the kind of salt we use, of course. With iodized or Diamond Crystal kosher, this needed 2 teaspoons, for me. With sea salt, far less! Remember to play and see what works for you. It took me ten tries before I liked the one I made! Shaunna, thanks! I’ll definitely try the bread again with less salt (I used regular table salt). I really do appreciate all your efforts experimenting w/GF. I LOVE to cook but have a 3 YO w/a very limited palate, so it’s always frustrating to put lots of time into something and have it not turn out to be something she loves. I really do appreciate your work! Do you think Tapioca starch would do the same work as potato starch? Shauna, do you think this would work in a bread machine??? Having just bought one, I can’t quite bring myself to turn around and make bread by hand! Thank you for your blog- your words and your wonderful pictures have me filled with inspiration! What were the egg substitutes suggested? Real bread without an expensive mix would be heaven — but we’re an egg, legume, soy, and dairy free house. Know which subs worked would be a real help! Please tell me that it isn’t a typo. . .you sure as heck don’t look 40. Thank you–I am only recently GF, and was envisioning a lot of trial and error in the kitchen. I love to cook, but with 3 kids, I don’t have much time to experiment. I can’t wait to check out your book. I love–and still make–the NYT bread. Mostly, I manage to not-eat it! I am delighted you worked out the version ‘we’ can eat. Around here, I have not been able to locate sorghum flour–three health food stores later. I would appreciate it if some has tried/would suggest a substitution. 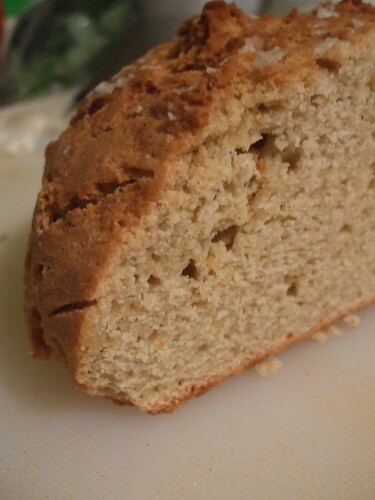 I made shauna’s IDGU Bread, and the texture was great, however I included garbanzo flour, and we–friends visiting– concurred, we would not opt for that taste. So if you have figured out what –besides sorghum works, I’d ‘ppreciate knowing! Shauna, just took the bread out of the oven, I must have done something wrong-can you tell me what the consistency of the bread should be when I am done mixing the 3-4 minutes? Other bread I have made has been pretty runny, but after adding 1/2 cup of the club soda it was pretty crumbly, I added about a half a cup more and then it held together, sort of like the consistency of real (with gluten) bread, which I know isn’t right either…..it turned out pretty flat, not airy at all. And salty too, I will adjust that next time as well…But! I’m not giving up, it looks so good I’m determined to make it better. Ok, bread has cooled. Texture is crunchy outside, full- bodied inside, just fine. I had been surprised, just reading the recipe, that some people found it salty. Now that I’m tasting it, what I do taste is the baking soda. Definitely. So, any solutions/suggestions? The baking soda taste might be considered salty to some people [or maybe their just tasted salty!] Mine definitely had a tastethat is not-so-desireable from baking soda. Help, please!!! I too tried this recipe exactly as given, and sorry to say I found it crumbly with a less-than-pleasant taste from the baking soda. However, I used the rising and baking technique with a different bread recipe and it turned out great! I used the basic sorghum bread recipe from GF Gourmet Bakes Bread. I don’t have a Dutch oven, so I used a rectangular Corningware casserole dish with a lid. The resulting loaf was crusty, had great texture, and most important, it didn’t collapse. I think that the thick crust all the way around the bread that results from baking it in a covered dish at higher heat helps it keep its shape. The bread was wonderful warm from the oven, and I sliced and froze the leftovers. The shape of baking dish I used made the perfect sized slices for sandwiches, and when toasted, they held up and didn’t crumble in the hand. So although the recipe as written didn’t turn out well for me the first time (I plan to try it again substituting something for the baking soda and adding a bit more liquid), the technique had fabulous results. I suspect it would adapt quite nicely to other recipes, although I haven’t tried anything but the basic sorghum recipe. Thanks for perfecting and sharing this technique! If I’m ever in Seattle, I’ll have a meal at the restaurant. I plan to eat my way across Washington from my home in Oregon to Vancouver BC someday! I just made this bread after having not eaten anything bread-like for months on account of adherence to The Body Ecology Diet. Wow. So good. Great crust! I found that substituting a few other flours such as quinoa and tapioca as well as the recommended ones worked just great. With some salt granules, rosemary, sage and garlic on top. Mmhm doesn’t get any better! Thanks so much for a scrumptious bread. I have been gluten-free for about 3 months now and was really starting to miss my bread. The recipe the way it is printed is good, but I took your advice and added rosemary, crushed garlic and a bit of olive oil. I absolutely love the results. It goes fabulously with eggs in the morning! Again, thanks for the recipe. My next endeavor is the chocolate banana bread with teff flour — I can’t wait!! My daughter not only cannot have wheat, but also cannot have vinegar. Any suggestions for a vinegar substitution? I had a happy accident with this recipe due to being in a hurry. I tried this technique with a packaged bread mix (no sorghum flour in the kitchen). I didn’t want to take the time to heat up the dutch oven, so I put the dough in the dutch oven to rise. Some was left over, and it went into a small spring form pan to make a hamburger-bun shaped loaf. When the bread had risen, I took the small pan out but forgot the dutch oven when I turned on the preheat. I remembered just as it was time to put the pans back in the oven, so it sat in the oven during the whole preheat cycle! But the bread turned out really good anyway, with a nice crumb and crust. I was so relieved, because I was drooling for some bread. Lessons learned: 1) pay attention! 2) Things just may turn out OK even if you don’t pay attention. Mu son, age 15, just found out he has Celicas. The bread issue is our BIGGEST fight. I am going to try this bread. Any suggestions for my teenager?? Thanks for your help. Has anyone tried mixing the dough using a bread maker yet? I don’t have a mixer, so I’m hoping I can use the machine for the mixing and then rise/bake it according to the recipe. I’m new to gluten free and am dragging my son along. I’m actually enjoying (wierd I know) the rice bread, but he hates it. He’s a bread and cereal freak, so it’s going to be a challenge. Hopefully this bread will work. you are great, what dedication. I can’t have xanthan gum or rice without getting sick. I don’t have your dedication, I only have one cornbread recipe that I can have, but I did just get 25 pounds of sorghum, so I should figure out something to cook with it. by the way, do you know the weight of the rice and the sorghum flower, they are different volumes depending on how fine that I grind the grain, so it is hard for me to reproduce without a weight. Thank you for the recipe! Any ideas for substituting the white rice flour (turns out I’m intolerant to white rice)? I’m new to the gluten free world and have been reading some of your past blogs. Thank you for giving me hope. I love bread and baked goods. One of your blogs mentions your husband’s restaurant in Seattle that serves your gluten free bread. What’s the name of the restaurant. My birthday’s next week and I would like to treat myself instead of feel sorry for myself. I love you! I have searched high and low for an artisan bread that will keep me away from the one I’m not supposed to have! Thank you so much for posting. I will refer all my gluten-free buddies to your site! Creating and synthesizing in the kitchen is in my blood. I didn’t know people used recipes for anything but baking until I was in college. Prior to learning of my wheat intolerance, I ground my own organic wheat and made exquisite artisan bread. I delighted in the sighs and the light in the eyes of those who would enter my kitchen after I had just pulled 4-5 loaves from the oven. Today I made a gluten free loaf from a mix and it looked, and even tasted like wonder white bread. I have made from scratch gluten free recipes as well, and well, they have the processed food flavor. I miss the whole grain taste, texture, and nutrients. I have yet to try your sorghum loaf and look forward to the taste experience, but what I am really looking for is a whole grain replacement. Do you know of any such thing? Has anyone tried to match the whole grain breads of say “Laurel’s Bread Book”? Currently, I am in transition, but when things settle I’d love give it a try myself, but for now I would be very interested to know what others have done. Thanks for the service you provide. I love your site and enjoy reading your posts. worse because the top portion was all dried out from being in the warmed oven. happened, and I was wondering if you could give me a hand. I just tried your recipe and your bread is amazing. I mixed it by hand so I can imagine it’s lighter using a mixer. Any hope for making a decent bread without yeast? No wheat, no yeast, no sugar, nothing processed. I miss the chewy, nutty, substantial taste of “real” bread. I made this bread yesterday! I'm so excited my recently diagnosed Celiac 5 year old daughter & Chef husband LOVED it! My daughter has egg allergies so I replaced the egg with Egg Replacer. I also didn't have potato starch but had tapioca starch. The third substitution that I made was regular distilled white vinegar for the white wine vinegar. Anyway, for those with egg allergies, the Egg Replacer worked fine. Growing up on a farm, my mom made bread from scratch (even grinding her own wheat). I think the tasted & inner texture of the bread is very similar o what she used to make! All that said, we SO loved the bread &will make it a regular staple in our household. I find out my results as to whether I have Celiac tomorrow. Love your blog Shauna & Chef! I cannot wait to try the club soda….who'd have thunk it! In my pre-gluten-free days club soda was my secret ingredient for successful biscuits. Delicious, delicious, delicious. I finally got around to trying this bread after one whole year of thinking (dreaming?) about it. Perfect with a pat of fresh, whipped butter. I cannot wait to make this recipe. However, I have looked far and wide for sweet rice flour. Will regular rice flour make do? Thanks! I don't know anywhere to buy it, but you can make it. either get a grain mill and just grind the sweet rice into flower. a low priced way to grind small amounts of grain (like the sweet rice) is to use a coffee grinder. Your site is wonderful. I am glad to stuck to it to perfect the recipes because that is the premise of my company: Fearless Bread. I am a baker and eater of traditional wheat bread that has also added gluten free baking to my arsenal. I teach a gluten free baking class that has really gained a lot of interest for people new to gluten free baking. My site is http://www.fearlessbread.com and I have a page dedicated to gluten free baking with a few recipes. My next class is at Sizzleworks cooking school in Bellevue on Monday October 5th at 6:30pm and preregistration with the school is required. Click the "class info" tab for details. It is a fun hands on class with instruction on yeast bread, muffins, brownies, and pastry pie crust. I'll be doing another one in November in Federal Way at Marlene's Market dedicated to holiday baking. Things like peach dumplings, holiday cornbread stuffing to go with Tom Turkey, holiday pies, and breads. My email is info@fearlessbread.com and I would love to hear your comments. Thanks and keep the "fearless bread" attitude! Oh, I wanted this to work so badly! I am trying to find an egg-free GF bread for the Thanksgiving stuffing (my first holiday without gluten, eggs, dairy, soy, etc), and tried this coming off THREE attempts so bad they went straight into the trash and a weekend inexplicably full of those Americanized Italian restaurants that serve nothing but bread, pasta, and pizza, and also I found out I'm allergic to hazelnuts, and I wanted this to work so bad! And it was terrible! The dough looked so promising. I substituted EnerG for the egg and corn starch for the sweet rice, because no one is selling sweet rice flour in my city apparently. I also don't have a mixer, so it was all whisk and biceps. And the yeast puffed up nicely and the dough was all smooth and lovely and it smelled so good in the oven. It even sounded hollow when thumped! And it was a brick, not a single solitary little air bubble. And it tasted like baking soda. Sniffle. Was it the corn starch? The lack of eggs? Did I not get enough air into it with my whisk? Sniffle. Oh Rachel, I'm so sorry. I'm afraid that cornstarch is entirely different than sweet rice flour, so that's probably part of the problem. And eggs are pretty important, so you have to make sure you have an exact replacement. The KitchenAid helps too. Try the dough I put up for the dinner rolls. I've also made it as a bread. I've learned SO much more since I posted this piece. (so long ago.) The dinner rolls are the best yet. After some perserverence, I have finally created an edible recipe for wheat-free no knead bread. (All wheat-free bread is no knead, actually). This one is so good, Kevinand I eat it too. mix together yeast, water, sugar. Let foam up- about 15 min. No foam- no good, start over with new yeast. In a separate bowl, mix all other dry ingredients. Once the yeast proofs (foams), add melted butter and eggs. Mix well in stand mixer. Slowly add dry ingredients until you have a sticky but blended dough. Cover with plastic wrap and let rise about 4 hours or so. Heat over to 450 for 1/2 hour with dutch oven or oven proof lidded bowl inside. When oven is to temperature, carefully take out dutch oven, spray with oil and dump risen dough inside. Jiggle so it settles in bowl, cover and bake for 30 min. Baked bread is golden brown with a crusty crust and a soft airy inside. Wheat- free rarity. This looks great. Thanks for bringing me back here– I have not been to this site in a while. That is because of starting a different way to eat. We saw a friend who looked so much better, happier , more energetic, and it turned out she done research–she's an epidemiologist– and, still mot feeling well after a few GF years, had put herself on the Specific Carbohydrate Diet. I was in the same boat and followed suit. So, do you –or anyone– think that this terrific method could work with almon– or other non-grain–flour?? I so love bread, and especially a good crusty loaf. Do you use Fleischmann's yeast? variations- I made this to take to a dinner- they asked me to bring a dark bread. I added a half cup of sesame seeds to the mix, which was a nice complement with the nutty sorghum flavor. I’ve also made it with a rope of cold, garlicy butter- put half the recipe in the very hot pan, then the butter and then the rest of the batter. The butter makes it richer (duh) and the garlic and sesame are nice. Use lots of finely chopped garlic, like 6 cloves or more. I did the same with grated Asiago cheese, putting it in the middle of the loaf, and that was yummy. I’m going to attempt this tomorrow, I think. I’ve never baked gluten free before, but since I think gluten is giving me ‘trouble’ I”m going to try it! Do you have a version of this bread without the gums and done in ratios?? I really would like to try it without gums as they are ridiculously expensive where I live in Canada. And I like your idea of ratio cooking. Is this the bread recipe you used for your gf stuffing for Thanksgiving?? Thanks!! Way back in Nov 2009 you said your dinner rolls were the best recipe yet. I am contemplating them over your NK Bread. Is that still what you recommend? I will be making GF Stuffing for the first time in a few weeks. Yes, I know it’s after Thx Giving. I want to know which recipe for bread will be the best for the stuffing. Also, thank you so much for all your hard work! I am GF for almost 2 years & your site is an inspiration! Keep you the good work. Hi Shauna! I am excited to try this bread- it sounds wonderful! I am noticing that there are variations in this recipe vs. the recipe in your book. Which version do you prefer, and what differences are there between the two, taste/texture wise? Thanks for all you do! Jennifer, I prefer the one in my first book. But I’ve learned a lot of gluten-free bread since then. So I’d probably use the most recent recipes on this site! Thank you so much for this recipe, I had to sub the sorghum flour as i don’t have any, I swapped it for cornflour as it was the best i had available other than white rice flour and to be honest wasn’t really expecting anything edible but its really quite good. I don’t think it is a patch on yours by the look of the texture but for an OMG I need bread moment when I was out of most flours, it has hit the spot. I am gonna order some more flours very soon and do it properly and I am sure I will be a very happy girl, the fact I am crunching bread crust is fabulous and I am not a fan of this method. I will be getting your book as soon as my pennies allow so I can see your tweaks and see if you have made a perfect recipe even more perfect! sure! Use one of the newer bread recipes on this site that is written in grams. Sub the flours he can eat in the same number of grams! Hey anyone has a good suggetion on high altetude GF recipe? Thank-you for the post. It looks so delicious! …but mine does not. It’s a very dense lump with no airiness. I’m wondering how ‘wet’ and soft the dough should be? I added just over 1/2 cup of club soda to form a dough and am now thinking maybe I needed more because it became a solid lump and that’s how it stayed throughout the entire ‘rising’/baking process. Maybe I need to try again. Hi, I don’t have sweet rice flour…. Can I substitute for plain rice flour white or brown? Can egg substitutes be used successfully? Two family members should not have wheat, dairy, eggs, soy, peanuts. So many gluten free recipes call for eggs. Will other types of sorghum work on this bread? I am an amateur artisan baker who has just been diagnosed with wheat allergy. I feel much better on the gluten free diet but I miss baking my own bread terribly. Your recipe with the sorghum flour looks promising and I am eager to try it. However the instructions are written for a stand mixer and I do not own one. Will hand kneading work enough air into the dough at that mixing stage just before the dough is transferred into the oiled bowl to rise in the warm oven? Curios has anyone ever used oat flour and made a bread that is yeast free with it? mine rose slightly, but still turned out heavy. Can I substitute lemon juice for the vinegar, as I am also allergic to this? Good Day, I need HELP urgently. I use to make our own bread using a bread maker. Yesterday I had the children tested for allergies. Can anyone perhaps help, its a TALL order. Dear Glutenfreegirl- I too am stubborn, but have now tried two GF recipes, the latest being your GF No-Knead, Artisanal Sorghum Recipe, and in each case could not get the dough to rise, at all. I followed the recipe exactly, but the baking soda was from the fridge(isn’t everyone’s ) and may be old. Also, I had to add almost twice the amount of club soda, to get it moist, and still it was dry, almost crumbly. Otherwise, I used all the correct ingredients. I want to conquer this recipe, but wonder what is wrong? Any suggestions? I just baked your bread recipe. Let me start by saying that I am a BIG fan of Udi’s GF breads. I am an intermediate to advanced home baker with nearly 40 yrs exp. I am very familiar with baking, yeast ( I do a lil brewing and vinting) and yeast doughs. I am somewhat disappointed with the results I followed the recipe verbatim even the 2 t of salt which I knew was not good for yeast. The result was much more like Food for Life brand rice bread. I would like to ask a few questions if I may. 1) what about a GF dough conditioner with lecithin for emulsion, VitC for the yeast and Ginger for the yeast? Barry farms makes one. 4) no dough hooks. Average working ppl do not have high end stand mixers. Dough hooks on lesser models (like I have) makes this dough tough and doesn’t add air. 5) this is a radical one. Add straight C02! Put tubing into the bread dough, turn on CO2 and blow it up like a balloon. Would any of these measures produce a bread more like Udi’s makes? Aislin, you are more than welcome to try any of these techniques. This is quite an old bread recipe. The ones we have developed since are much better. If you would like to try one of our recipes, may I suggest one of those? And if not, try all of these ideas for your own recipe!